Reims is the site of the unconditional surrender ending World War II in Europe, a sobering reminder of the cataclysm. At 2:41 am on Monday, May 7, 1945, three high officers of the German armed forces sat with American, British, French and Russian officers and signed a declaration of unconditional surrender, ending World War II in Europe. The signature took place at a red brick school just northwest of the train station in Reims (map), which was then the headquarters of General Dwight D. Eisenhower, Supreme Allied Commander in Europe. 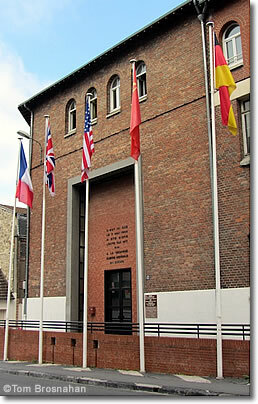 The school is now the Lycée Roosevelt on rue du Président Franklin D. Roosevelt, and the room in which the surrender took place is now the Musée de a Reddition (Museum of the Surrender). Signature took place in the headquarters' Map Room, which has been preserved as it was at the time—literally under glass, as glass panels separate the viewing area from the walls covered in war maps and statistics, and the simple school table at which the generals and admirals sat for signature. Low on the wall by the door where you enter is the Headquarters' typewritten daily bulletin noting the surrender, along with casualty reports (tens of thousands killed, hundreds of thousands wounded or missing) and supplies arrived (millions of tons). Other rooms hold exhibits of uniforms, press reports, war souvenirs and artifacts from the conflict and the part Reims played in it. The museum is open from 10 am to 6 pm, closed Tuesday and on four major holidays. You can walk there easily from the Gare de Reims. 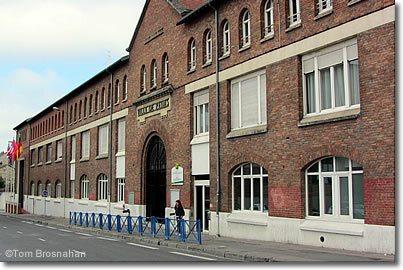 The school building holding the Musée de la Reddition, Reims. Musée de la Reddition, Reims.